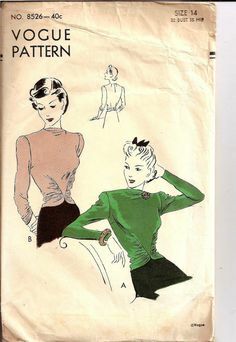 I mentioned that I was interested in constructing a Vogue 1940s blouse in a knit. I found this a fascinating project and one I want to develop further. The pattern is, to recap, meant to be made in a stable woven fabric, and has closures galore, including on the sleeves, and at the CB to secure the “girdle” over the closure at the side seam. I couldn’t face it, and thought that this design might work well in a jersey fabric. I found just 1 metre of a pinky purple polyester with elastane in my cupboard. Not enough for full length sleeves, but enough for a toile. At the front you can see how the longer side sections are gathered into a diamond. At the back the girdle didn’t really work on this first version. Mainly because I cut two pieces, with sufficient to overlap and fasten (as per the pattern). I should have joined the pattern pieces together and just cut out one back piece. I decided to leave the darts in the back, the bust dart, the elbow dart and the three darts at the top of the sleeve. It is these darts that give the top its vintage feel, even though (as many mentioned) it would have been possible to omit them, or just ease them in. The neckline has a tiny cowl and I bodged this, just finishing it and letting it drop inside. I left a larger opening at the neck to enable me to pull it on. I stitched all the seams as normal, and didn’t overlock at this stage. I used a stretch needle and a smallish stitch and it went fine, although once or twice I nearly encountered the problem of the work disappearing down the hole in the machine. I stitched the girdle into the side seams, gathered it at CB and stitched it to the body of the blouse. I was not happy with this effect and have a new plan for the second version that I will make. The top is really nice to wear and promising. I quite like a T-shirt, but they are so boring aren’t they? So if I can make a pull over jersey top with a bit of character then it has to worth some pattern development and further experimentation. Next time I will make long sleeves, and I think I will try a different arrangement at the back, probably adding some gathering at the side seams, and leaving out the extra girdle. On the other hand I love the way the gathering at the front creates a little curve. It just shows my navel (probably inappropriate at my age) with these trousers. But it was fine over a lace skirt for work last week. I am also keen to see what improvements I might make to the neckline – perhaps adding more fabric that I can fold into the sleeve seams to create a clean finish inside. Vintage Vogue 8526 It’s got legs! The trousers, by the way, were made very quickly with an old 1970s pattern. The waist band was right up under my ribs, so I lopped a bit off and created a facing instead. Eagle-eyed readers will see that this is the same fabric I used for Esme’s circular skirt. They are, now, comfortable and fun, and fine for sunny Sundays and holidays. I may shorten them to Capri length as the fabric is quite loud. But every now and again everyone likes a pair of patterned trousers – Stephanie of My Vintage Inspiration loves them so much she is making herself another pair of “crazy pants”. In the meantime I will trace off the old Vogue 8526 pattern and play around with it. So more to come on this one. I love this top. I never would have envisioned it being so pretty, as the original design seemed quite formal and stiff to me (especially at the shoulders). It has so much potential for variations, too, as you say. My favourite part is the front girdle area. PS I have already forgotten what you call this lovely purple-y pink but it suits you so well. It looks great, good idea to try the knit. I like it in knit, both more practical and softer. 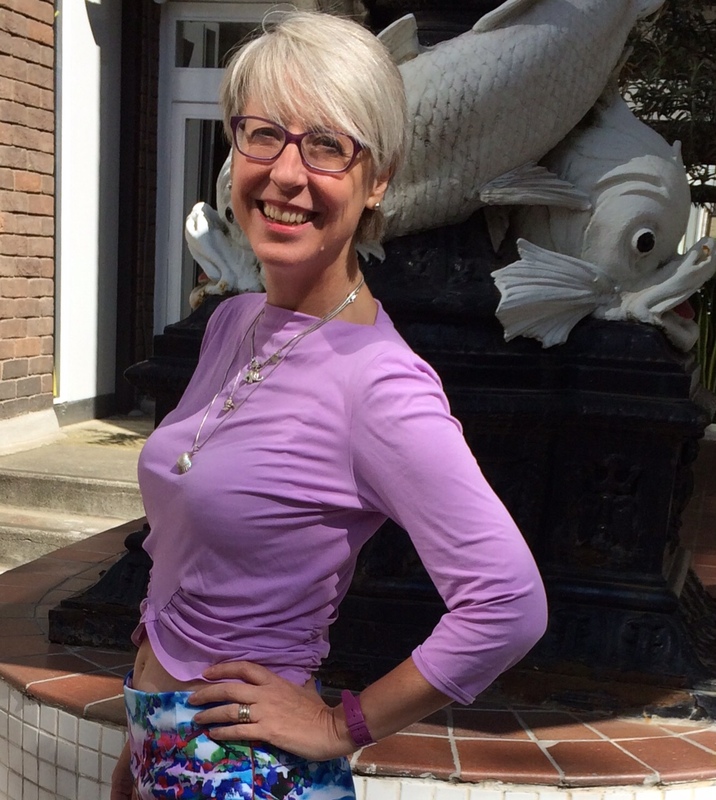 Great top, and the post reminded me that I bought some great floral fabric stretchy canvas to make trousers, and it’s still languishing somewhere – so much fabric so little time! I’m off to the meet up on Saturday, so may see you there. Oh I so hope so! It would be great to meet you Gill. This looks great on you and emphasises your neat waist. I love the front gathering. It creates lots of tszuj. I wanted to write jujj as in “jujj it up a bit” but didn’t know how to spell it so I googled and found that tszuj is the perfect description. I have just bought 4 t shirts in the sale and now they look so boring. I may have to tszuj them up a bit, but how? They are getting some use this week I am pleased to say as the weather is perfect and we are in Somerset with 4 grandbabies. Well I never knew that. But I do now! Thank you Jenny. It’s nice to enjoy a little bit of the summer sun. We are going away next weekend with our, so I am hoping for a last hurrah! Cute, cute, cute blouse with so much style in the knit. I too thought the original looked more formal but you have made it look so wearable and modern and quite a few notches up from a t-shirt. Your pants say, “I’m a wild and crazy gal” and I would leave them long as well otherwise the eye would be torn between the cropped hem and the waistline hem which is just delightful on you! Lovely colour on you. And a good match for the trousers. Like others, I would keep them long. Good foresight Kate, to see the potential in this pattern. That looks fabulous in knit fabric, and you could always lengthen the torso if you felt it necessary. It’s a great colour on you too. What lovely waist effect and the pants are fab, you look totally at ease and well put together. This is a good illustration of how fabric choice can completely alter a look, I think that is why I need designers and why although I aspire to having a basic block I have many patterns that only vary in small details. The devil is in the detail. Wow, the top you made is way nicer than the pattern indicated. Love the combo. The front gathering is so cool… and shows off your fab abs! ;D I do agree that the back gathering could be changed, but overall this is such a neat shirt! This looks spectacular on you! Oh, like others have said, I like it better with the more modern and softer look. Love the colour. I’m looking forward to seeing its next incarnation. You are off to a good start with this idea. I back gathering doesn’t seem to hold in the stretch jersey, but that is just a minor tweak. I agree Gail. Next version will have to wait as I am on an embroidery marathon at the moment….